Thanks to what you just learn, you are now able to draw with TVPaint Animation. 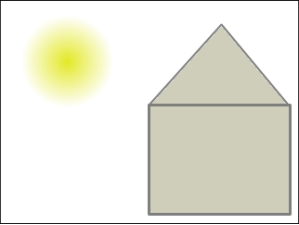 To draw the little house described at the beginning of that lesson, please use the Rectangle, Line and Flood fill tools. Use the Airbrush or 2-pts circle with a gradient to the transparency to draw the sun. This drawing will illustrate the next steps. At this point, it seems at first sight that the image is mainly composed of white... in fact, that is not the case ! Now change the Background option (bottom left of the timeline) into None, then into Check and note the changes taking place in the current project window. It's as if our house and sun were drawn on a glass plate, the latter resting on a colored background (see perspective diagrams above...). What we will refer to as Layer in all future lessons is the equivalent of a transparent glass plate placed on a colored background of your choice. You are drawing on this plate and not on the colored background. It is possible to change the color of the backgrounds Check and Color. To do so, click on the little colored square on the left, in order to obtain a cursor followed with a “?”. This cursor indicates you that you may choose any color on the interface of TVPaint Animation. The second colored square will define the second color necessary for the Check mode.